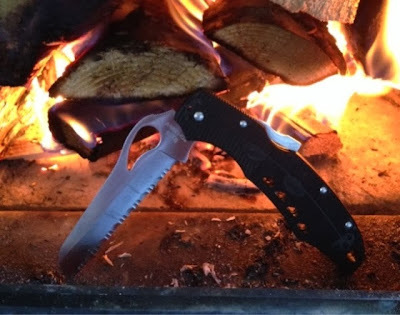 I was battoning a piece of firewood of a diameter in excess of what a folding knife should rightfully be used to split (never stoop so low as to use paper to start a fire), when something in the locking mechanism snapped. I'm actually impressed with how much abuse this knife took, and how long I was able to keep up with one knife without it getting lost. If I recall correctly Byrd is Spyderco's budget priced line of knives, and I paid about $30 for it new. I probably won't make any attempt to repair it or try to claim warranty. This knife's had a good run.. RIP.